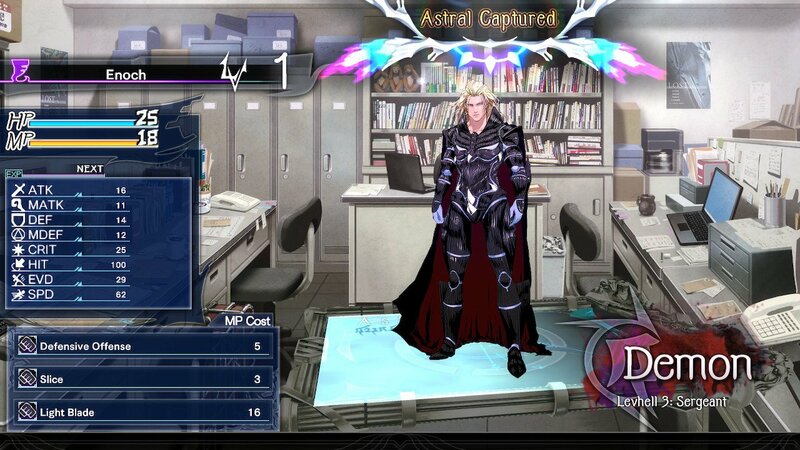 This is a game by the creator of El Shaddai: Ascension of the Metatron. That game was made over at UTV Ignition and specifically Ignition Tokyo. Now that Ignition is no more, the creator decided to work with Kadokawa Games in Japan from Crim to make a more classic dungeon crawler-style game similar to Etrian Odyssey, but also with seemingly some visual novel elements. How does this game fare? You know the drill, time to find out! A typical battle in a dungeon. 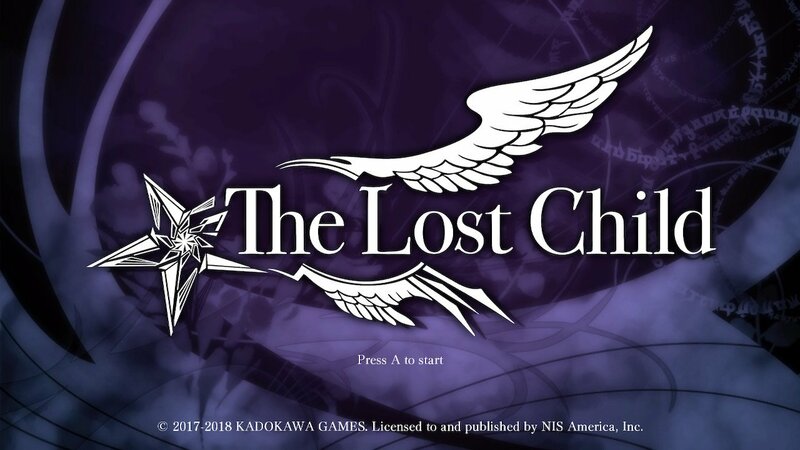 The Lost Child is a turn-based 1st-person dungeon crawler JRPG, something like Etrian Odyssey, but with some differences of course. This game’s presentation involves a lot of (fully-voice acted) dialogue cutscenes that show character portraits with some differing emotions. The main meat of the game is of course the dungeons. if you’ve played JRPGs before you have a basic idea of what to expect. You fight demons, you take turns attacking, you gain experience from defeated foes and level up when you gain enough, etc. However There’s a system that involves you catching demons with the Astral Burst technique. This is an attack that, if it deals the killing blow, will catch the demon and you can then use it in your party. Lua as seen in one of the many 2D portrait cutscenes. Demons however need to first be purified, and to do that you need to use karma. 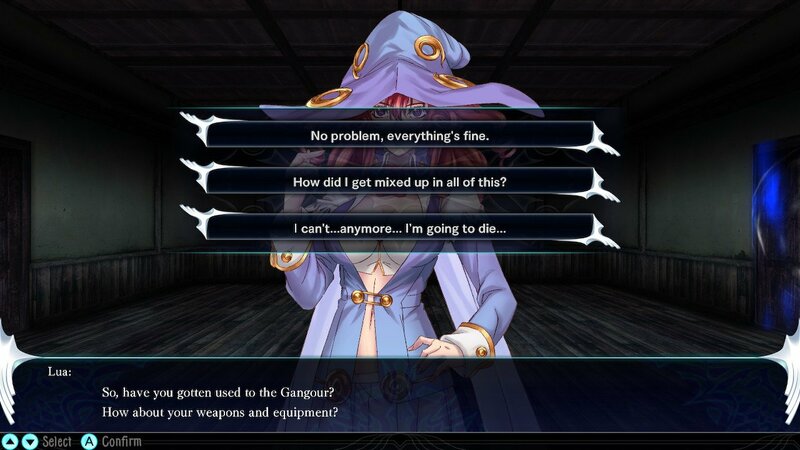 Bits of karma are gained after each battle, and you can also gain more by choosing different answers when choices come up in cutscenes. Karma come in three colors; red, blue, and purple, with each answer in a choice giving you one of the colors. Red karma seems to be the most used one though, as it’s the most recommended one for doing something else that’s important; purifying and strengthening demons. 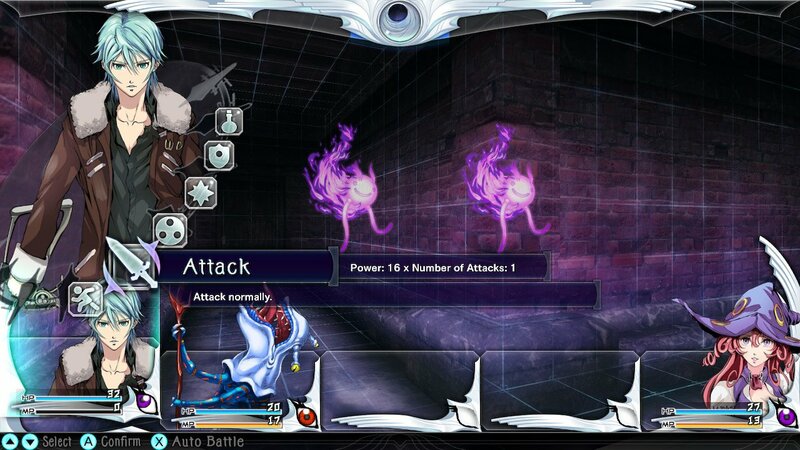 To clarify, demons don’t gain experience from battles, only Hayato and Lua do. You need to feed the demons karma to do so, and red karma is the most beneficial to use because it gives demons more experience than the blue and purple karma. One of the multiple choice events that pop up from time to time. As for the dungeons themselves, they are naturally large mazes. You take a step as a turn of sorts, and after each step you have a chance of running into a wild demon to fight. There are also numerous doors in the maze that can be unlocked by a respective switch that’s located nearby usually. There are also treasure chests scattered in dungeons (some also appear after killing or catching a demon), and you are given a sort of mini-game to open one. You can just try to unlock it but you have to be careful not to let the left red danger line get filled up or a trap will be set off. You can examine the trap to get a clue on what said trap is, or you can simply give up and try again (not likely so with ones from demons). Such trap effects include disabling the map and also preventing you from warping out of a dungeon. If the right blue line fills up, then the chest opens and the treasure is yours. Treasure can be accessories for power boosts, some junk you can sell, or new weapons and such. This is the view during dungeon exploration. The map has been enlarged for a better view. Each dungeon also has multiple floors of course, and each time you reach a new floor (or Layer as they’re called), you can save the game at a floating green marker. Unfortunately the only ways to heal your team is either using Lua’s Angel Light skill to heal a team member at the cost of MP of course, or to leave the dungeon, either manually by going allll the way back to the entrance, or by using a warp item called the Byakhee Return which is akin to the Escape Rope item in the Pokemon games. You heal all HP and MP as soon as you reach your HQ at the LOST Office. One other aspect is evolving your demons. There’s a place on the world map called Chodenji where you can meet someone called the Cyber Priest that speaks through a screen. 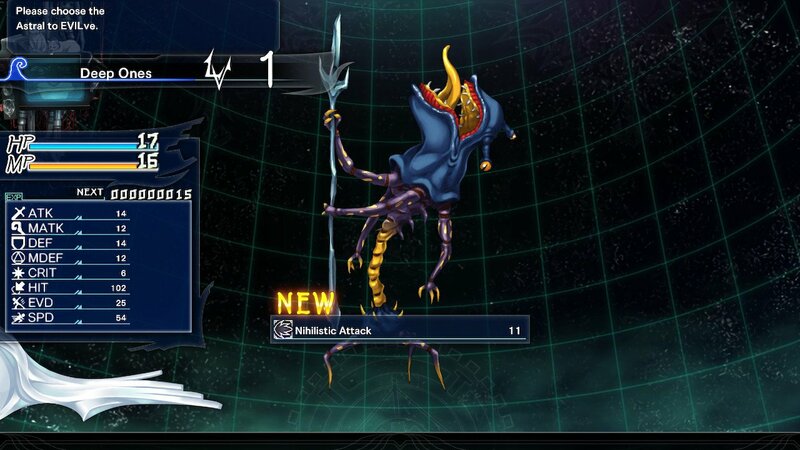 He can both evolve your demons as well as swap skills between two demons you have, offering a customization element. You can evolve a demon once it’s at max level (around 12-15 I’ve noticed) and using a required item you may have picked up (like one called Darwin’s Branch). Once you evolve a demon it goes back to being at level 1. The second form of the Deep Ones demon. Now with even more blue! Visually the game evidently was a Vita game. What 3D the game uses is very simplistic. Really you’re staring at 2D art for a large chunk of the game, as demons are always 2D artwork. Character designs look quite nice and demons are relatively well designed. Audio-wise the music seems decent but not terribly remarkable. The game’s 99% fully voice-acted which is VERY much appreciated, and they all pretty much sound great. Hell even the demons each have a voice clip that plays when purifying them or putting them into your party. Lua herself has a very delightfully over-the-top performance. You can tell her voice actress had a bit of fun with her performance which I really liked! 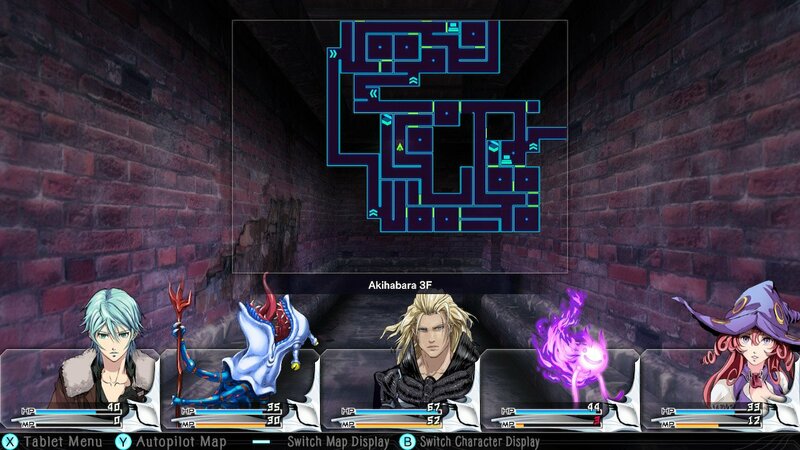 Enoch joins the battle from El Shaddai! As always I’d suggest watching some footage to see if it’s up your ally. I guess I’d put it in a “wait for a sale” category, since the price may be a bit high, I dunno, to some folks. 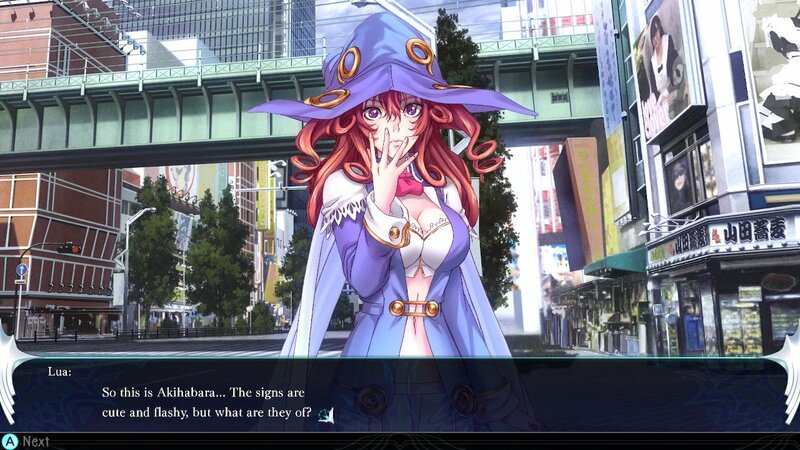 + The game has nice 2D art with nice expressions (they phase between each if you know what I mean). + the combat is fun, as is the demon catching aspect. + The story is fully voice-acted. It’s just some minor text during gameplay that isn’t. + The game isn’t too difficult. + Characters are voiced very nicely, and Lua is very over-the-top which I really liked. – It’s not the prettiest game in terms of 3D graphics. It works, but some bits look REALLY obvious that the game started out on Vita. – Music wasn’t very memorable. – No spots to heal up during dungeons. You have to leave manually by walking back to the entrance to fully heal and then come back in to move on. – No video capture support.